Yesterday I posted a request for healing. 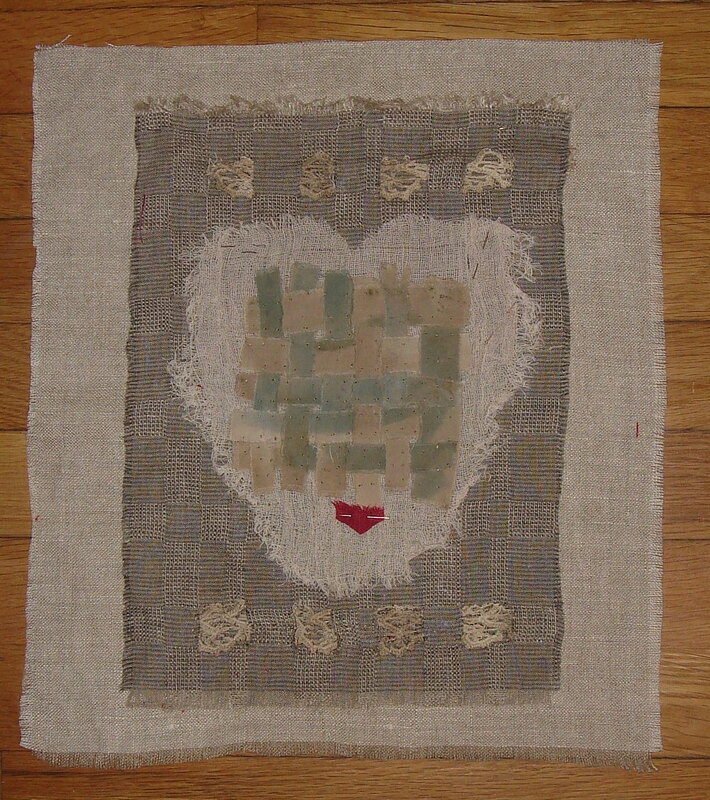 And because this is a blog about cloth, I used pieces of cloth to illustrate the request. Only the woven center was mindfully constructed with focus on healing. The gauze and red linen were just there–so I used them. It was that unplanned. Not a project. Not the beginning of something else. Simply cloth and color accompanied with a request that healing flow towards a loved one. Or so I thought. I left the cloth pieces on the table and several times during the day looked at the little pile –the gauze was turning into something that suggested a heart. An unplanned surprise. But the red linen started Really bothering me. Nice by itself, but clashing somehow with the overall intention. Clearly lacking gentleness. Off and on during the day I switched out backgrounds. Nothing was working–better, worse–but never just right. So I went to bed. This morning just as I was ready to pitch the pieces in the scrap pile, I tried one more thing–auditioned one more piece of fabric that I’d been saving for something special, and immediately it seemed to pull things together. But the muslin strips weren’t right. So I replaced them with old pieces from my grandmother’s pillowcase crochet–black walnut dyed. And the cloth started to speak to a sense of ease, or comfort, or gentling. Started to speak towards healing perhaps. A very interesting evolution. All happening seemingly with a life of its own. And it’s still going. Now I’m hearing that Maybe just a touch of the original red is called for here? A reminder of fire, energy, life force? The transition of the piece to the place of “home” where it now rests is so much the story of listening to the cloth..your results speak a story of healing on so many levels…the addition of the grandmother lace is more than just right, it brings to my eyes and spirit the language of history…healing..soothing and alive with the energy of health. Hi Kristin. So very good to have your input. Yes, the grandmother lace–I’ve so hesitated to cut it, but this is where it wanted to be. Blessings. 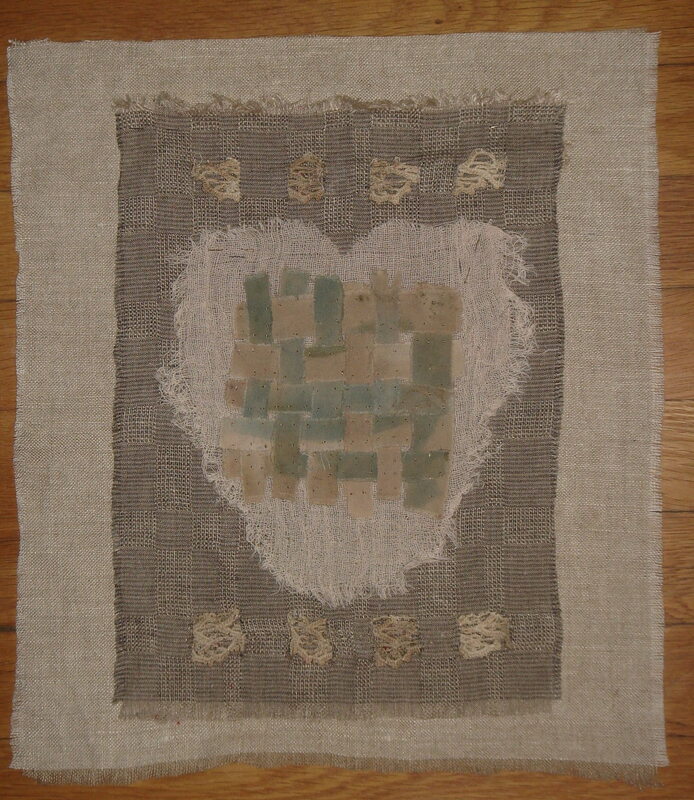 how appropriate is the ‘kiss’ for a healing cloth. loved seeing where it came from. i would leave it just the way it is. changes are happening with the cloth and i’ll post it when it says it’s ready! A beautiful piece, Patricia, soothing for the soul!